Breathtaking image quality meets unrivaled shooting freedom in the Sony Alpha A7 II, the world's first full-frame camera with 5-axis image stabilization. Now you can fully express your vision with full-frame quality and cutting-edge camera shake compensation compatible with wide-ranging lenses. But Sony didn't stop there. Operation is incredibly intuitive and enhanced Fast Hybrid AF delivers lightning-fast focusing, super-wide coverage and tracking performance that captures fast-moving subjects and doesn't let go. 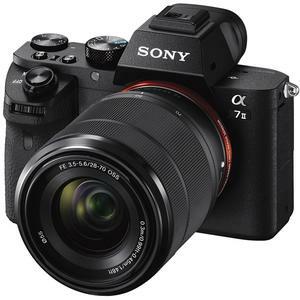 Packed with innovation yet compact beyond compare, the Alpha A7 II frees you to shoot however you like with confidence. 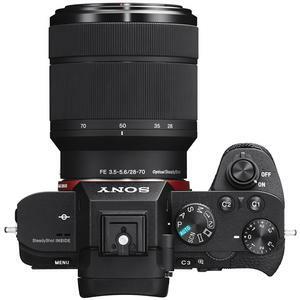 This outfit also comes with the Sony Alpha E-Mount 28-70mm f/3.5-5.6 OSS Zoom Lens, an affordable mid-range zoom lens for 35mm full frame format cameras that combines high optical performance with compact, lightweight convenience. It covers the popular 28mm through 70mm zoom range with minimal change in physical length while zooming, and is an ideal match for full-frame E-mount bodies. New 5-axis image stabilization lets you enjoy unparalleled handheld shooting freedom with more of your favorite mountable lenses. 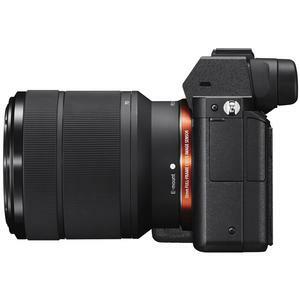 The short flange-back distance in the E-mount A7 II contributes to broad lens compatibility. * When using a third-party mount adapter, performance, functionality and operation are not guaranteed and Sony will take no responsibility if a malfunction occurs. Confidently use all of your favorite E-mount and A-mount lenses, knowing the A7 II will analyze information from the lens to optimize depiction performance and 5-axis image stabilization for the particular lens you mount. When using E-mount lenses with optical stabilization (OSS), the A7 II combines the best of in-lens and in-camera image stabilization to compensate for camera shake on five axes. The image sensor delivers beautiful images from corner to corner and stunning 24.3-megapixel resolution. You'll enjoy low noise, an extremely wide dynamic range, and amazingly rich and subtle gradations. Moreover, innovations that could only be achieved by Sony reproduce details more faithfully so that every scene looks incredibly real. The newly enhanced Fast Hybrid AF system delivers extremely high-speed response, highly accurate prediction and wide area coverage for autofocusing and tracking you can always depend on. Remarkably fast for a full-frame camera AF system, it ensures maximum speed by optimally employing phase-detection or contrast-detection AF depending on the scene. The remarkably compact and lightweight body is solidly built to withstand the rigours of shooting in the field. It's the ideal blend of lightweight, solid reliability and steady handling, thanks to a top cover, front cover and internal structure constructed of rigid magnesium alloy. The α7 II packs powerful movie-making capabilities in extremely compact dimensions. You can create movies of breathtaking visual and sound quality with exquisite background blur, remarkably clear details, and the sensitivity to bring dark scenes to vibrant life. Features like Picture Profile and P/A/S/M modes further expand your creative options. It's easy to keep moving subjects in focus with enhanced Lock-on AF, which analyses even more information from the scene to ensure usage of the optimal AF point for smooth, stable autofocusing. Its ability to detect and track moving subjects has now been significantly improved, thanks to Sony's advanced proprietary image analysis technology. This proprietary Sony gamma setting, featured in professional camcorders, creates a 1300% wider dynamic range for smooth expression of gradation with reduced white-out and black-out. Through color grading in post-production, you can make the most of the low-noise image and super-rich detail to achieve various types of image expression. This function provides a "Record Run" setting that only advances the time code while recording, a "Free Run" setting that advances the time code whether recording or not, a drop frame method and a non-drop frame method. 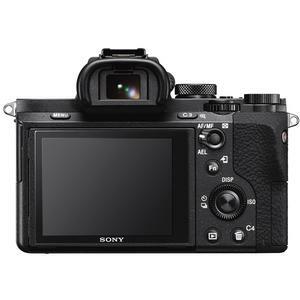 The α7 II can also output an embedded time code when the clean HDMI output setting is in use. The LCD screen tilts upward approx. 107 degrees and downward approx. 41 degrees to accommodate wide-ranging shooting angles. This flexibility combines with compact mobility to greatly expand your shooting options. Viewing is also clear under direct sunlight thanks to WhiteMagic technology that nearly doubles the brightness of the display. Controls are refined for intuitive operation and immediate adjustment of parameters while viewing scenes through the viewfinder. The front and rear dials have been thoroughly refined and positioned with overall handling in mind to enable easier, more efficient turning. 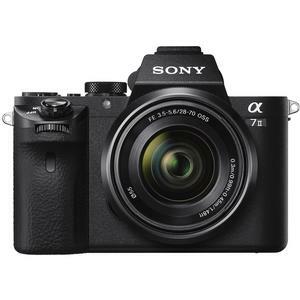 It's a level of refinement that even surpasses that of other α7 series models. Instantly transfer a photo or MP4 movie to your Android smartphone or tablet by simply touching it with the α7 II -- thanks to built-in Wi-Fi and NFC (Near Field Communication)*. Touching your mobile device with the camera can also activate Smart Remote Control, which lets you control the camera's shutter release from your smartphone or tablet. * Requires NFC-compatible Android device. To keep your photos blemish-free, a special anti-static coating on the surface of the optical filter suppresses the attachment of both dry and moist dust particles when changing lenses. An anti-dust mechanism also vibrates at high speed when you select Cleaning Mode to remove any particles adhering to the filter. The exciting new application download service, PlayMemories Camera Apps, lets you add new functions to your camera's existing feature-set to heighten photographic expression according to your own creative needs. Storage: "Memory Stick PRO Duo"